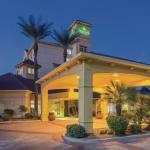 The La Quinta Inn & Suites Phoenix Mesa thrills our guests with freebies like breakfast and internet access in a location a half-mile from Fiesta Mall. This seven-floor hotel offers 125 comfortable well-appointed rooms with free high-speed internet access and cable TV. Each morning the hotel serves a free breakfast buffet. Business services such as copying faxing and printing are available on-site and the fitness center and outdoor heated pool and hot tub provide just the relaxation you need after a day of working or touring the area. Parking is free and pets are welcome with some restrictions. Shopping at Fiesta Mall is an easy eight-minute walk from the hotel. Downtown Phoenix is less than 25 minutes' drive and downtown Gilbert is six miles away. Phoenix Sky Harbor International Airport is 13 miles from the hotel and Phoenix-Mesa Gateway Airport is 17 miles away. Dogs up to 30 pounds are allowed. There are no additional pet fees. Dogs must be leashed and cleaned up after.